I thought there might be a good chance that Governor Wolf would sign the bill. There are a lot of hunters in Pennsylvania, and this looked like the kind of fight he might not want to pick. I’m sure Pennsylvania going red in the Presidential race may also have played into Wolf’s thinking. It’s really not any big deal, since Pennsylvania was one of the few states that ever restricted hunting with semi-automatics. I don’t hunt, so it’s not something I’ll personally take advantage of, but I’ve heard a few “you can’t hunt with them” arguments for restricting semi-autos, so it’ll be good to see that put to rest. Act 68 also removed the prohibition on using airguns for hunting. I’m hoping that the PGC will promulgate regs allowing both semiautos and airguns for hunting in time for the 2017 season. RIP Remington 7400, supposedly PA’s restrictions on semi autos for hunting is what kept the only remaining centerfire pump gun in production. I heard my groundhogs petitioned the PAGC to drag their feet… Now I can finally use my old Bushmaster AR varminter for what it was designed for in PA! I’m glad to see the governor didn’t want to waste political capital to prevent the state from moving into the 19th century. We need to use this to unite the gun owner voter base. If we can do that, then we have a much more secure future. For too long there has been the Fudds and then real gun owners — this should eliminate that gap. Thank goodness. The current rules are so complex it borders on ridiculous. Of course, none of this takes into consideration muzzleloaders, bows, or non-toxic shot required when hunting waterfowl, all of which are regulated by separate rules. 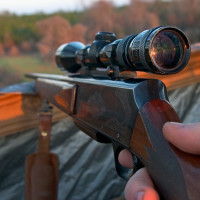 Semi-autos should not be allowed for Big game hunting..shooting 5 bullets at running deer or bear wounding deer and possibly a hunter ..kids and adults will not take clean shot like now it will be BROWN AND ITS DOWN get on radio and call for tags ..
bad shots will be taken because you have 4 more shots and other deer will be hit ..You want to get rid of deer in pa allow use of semi-autos …It is ok for small game and coyotes but never big game..